The widespread adoption of cloud computing and software as a service (SaaS) is a threat to existing on-premises applications and independent software vendor (ISV) business models. But it is also an opportunity for ISVs who step up to meet market needs. This paper examines the trends that are driving cloud and other computing innovations. It explains how platform as a service (PaaS) provides a new development platform to deliver the new applications businesses need. 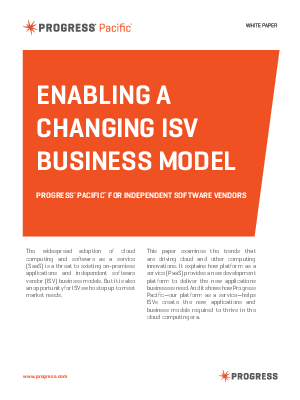 And it shows how Progress Pacific—our platform as a service—helps ISVs create the new applications and business models required to thrive in the cloud computing era.